Controversy surrounds the decision to grant planning permission to a new conservatory in the West Midlands. The proposed structure has three levels, a cinema, a food court, a floor space of 150,000 square metres and two car parks. Large scale changes to the surrounding road layout, evidence of a significant volume of commercial activity, an extensive advertising campaign and the fact that the complex is four and a half miles from the building to which it's supposed to be attached have led some people to the conclusion that this is a retail development and not actually a conservatory at all. Responding to these criticisms, local planning officer Sally Hod nevertheless maintained that the application had been considered extremely thoroughly. "It's unusual, certainly," she explained. 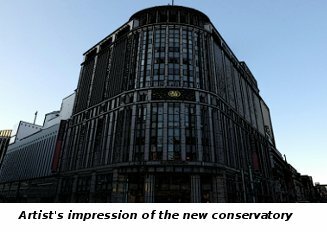 "Not many conservatories have escalators, for example. But we're quite confident that there's nothing improper about this application. Our experts have examined the plans very carefully, and it clearly says 'conservatory' at the top."